Riding the train to work last week, I put together an invitation for Max's 14th birthday party. It's going to have a (what else?) firefighter theme. But there will be a clown, the same awesome one who's been at previous parties. Max has been having parties at a bowling alley for the past few years but now that he wanted it back at our house, he asked to have her there. I tried to wrap my head around the fact that Max was turning fourteen. FOURTEEN. How did that happen?! And then, as I searched evite for firefighter-themed invitations, I tried to wrap my head around finding one that didn't look too childish. I settled on one with a fire hose. But then, did the look of the invite even matter? I have a teen who continues to love all things firefighter and fire truck. 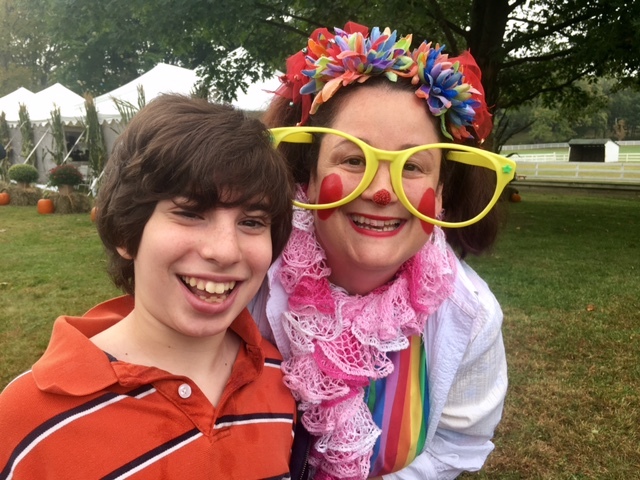 I have a teen who enjoys having clowns at his birthday party who hand out balloon animals (and who is blissfully unaware of the sinister clown phenomenon of 2016). I have a teen who wants a birthday cake with a photo of his favorite fire truck on it, and who insists on being called Fireman Max. Come the holidays, I will be looking to buy Max—at his request—yet more fire trucks to play with; he enjoys sitting on our deck or in our basement and zooming them around. Some of the toys' packaging will proclaim "Ages 3+" and the like. The new firefighter boots he wants are a bit of a challenge to find, as they're all little-kid sizes. Sometimes, this gap between what's considered age-appropriate and Max's reality gives me pause. 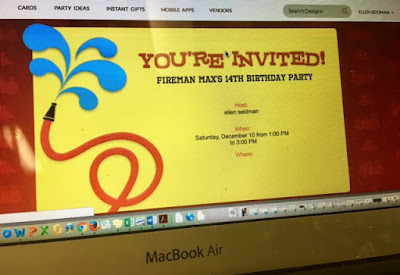 I sat in my seat on the train and stared at the fire-hose invitation, pondering it. As inevitably happens at times like these, I had to come to grips with my reality—and let go of preconceptions about how your children "should" behave. In the end, it comes down to this: what makes Max happy makes Max happy. Recommended ages? Who cares. Too babyish? Doesn't matter for events like these, where he's surrounded by family and friends who accept Max for the ebullient, fun-loving, firefighter wannabe boy that he is. I filled in names on the invite list, and then I hit send. I read a blog post somewhere (I really wish I could remember) that talks about age-appropriate and age-respectful. About giving our children the opportunities they need to grow in all ways, but also being respectful as to where they are and what they like. So you are being very respectful of Max. At the same time I know you and Dave are always giving him opportunities to grow. That list is endless. And I agree. I think of ages in terms of safety and themes (toys that are likely to be a choking risk for younger children or a horror movie that might not be age appropriate for a preschooler) But people should be allowed to love what they love, whether or not that is typical of other people their age. I've always had a range of interests, from those considered "young" for me to those considered "old." At 14 I was into Mr Rogers and the Boston Symphony, for example. Neither of these were typical, but neither were wrong. be the mother he needs and deserve !!!! I completely love this. I found myself asking this same question in regards to what t o get our daughter for christmas, and what gifts would be "age appropriate" for her, and had to realize that what other 2-3-year-olds play with doesn't have to be what she plays with, it just has to work for her, and make her happy. When I picked up my 23 year old son's last birthday cake, the particularly chatty check-out woman looked at the design he had selected and asked how old the little boy was, 3 or 4? And my heart broke again. Oh, I'm sorry. I know how you feel. I am perfectly content letting Max be Max but innocent comments like this can really get to you. That is a brilliant hack, and I will be trying that, Mar! Thank you! I think that's beautiful. Age is overrated in my opinion anyway. I completely agree. If its what makes him happy thats great. My child has been asking for xmas gifts. She happens to like some preschool toys still which make her happy. I don't know where MBTI would fall on the age scale...and, frankly, I don't care.